In this paper, issues related to the concept of ‘blended cognition’ involving systems of humans and autonomous machines, or what we term Human-Autonomous Machine Systems (HAMS), are considered. We specifically address questions such as, what do we know about human cognition that would allow us to ‘blend it’ with artificial cognition, and what do we mean by the term ‘blending’ anyway? In doing so, a large literature review and analysis of human reasoning, decision making, and meaning making is provided. We focus on human cognition because, in our view, much of what is discussed in the HAMS literature is incomplete when it comes to human cognition. The analysis is concentrated on the issue of meaning making (also called sense making) which, in our view, is the most critical cognitive ability on which members of the animal kingdom depend for survival. We offer a theory of meaning making that entails pattern synthesis and memory re-combination. 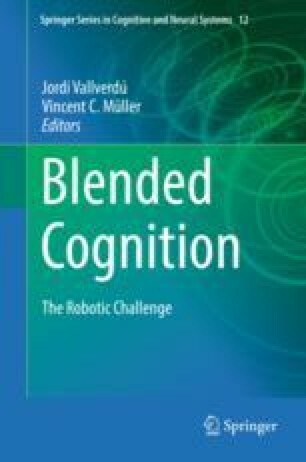 This theory is then extended to apply to blended cognition: we propose that the ‘blending’ of human and autonomous-machine cognition can occur through the manipulation of human and artificial memory during the pattern synthesis and memory recombination process that accompanies meaning making. This chapter has been cleared for public release 27 April 2016 (Case Number 88ABW-2016-2130).